“Sofia and Maddi live in the same neighborhood, play in the same park, and go to the same school. But while Sofia[s fridge is full, Maddi’s fridge is empty—white empty—just a small container of milk. Sofia keeps her promise not to tell; still she must help her best friend. That night, Sofia’s mom makes fish and rice for dinner. There is enough food that even Pepito, the dog, had some fish and rice mixed into his dog food. Sofia got a great idea. She asks her mom if fish is good for kids and mom says it iss perfect. That night, Sofia put some fish in a baggie and dropped it into her backpack. The following day, Sofia’s backpack stunk of inedible fish. The following night, Sofia’s mom makes frittatas for dinner. Again, even Pepito has frittata mixed into his bowl. Sofia asks if eggs are good for kids . . . see where this is going. Yeah, Sofia tries to help her friend and keep her promise at the same time, but backpacks filled the night before, and sit outside the fridge waiting for the morning to arrive, do not make good transportation when sneaking food for a friend. Sofia knows she needs help. Can she break her promise to Maddi? Kids will understand this story; laugh at the funny moments, and leave wanting to help others, as kids are prone to do. 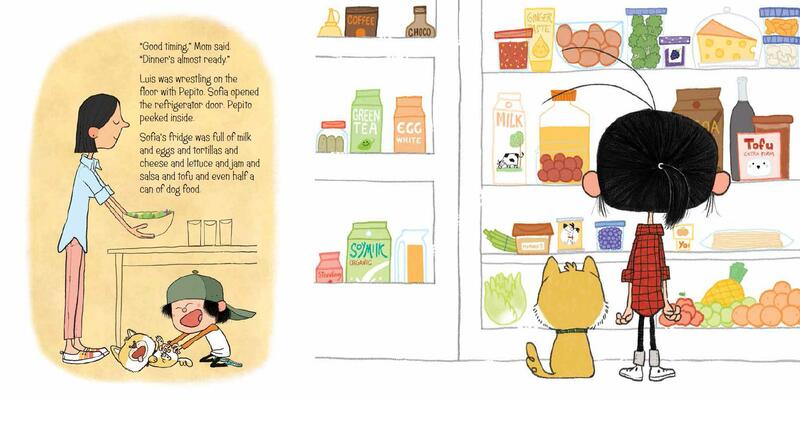 In Maddi’s Fridge, Sofia’s brother offers his favorite food and Pepito offers his bowl and a can of dog food (what a happy dog—I thought it was a cat). 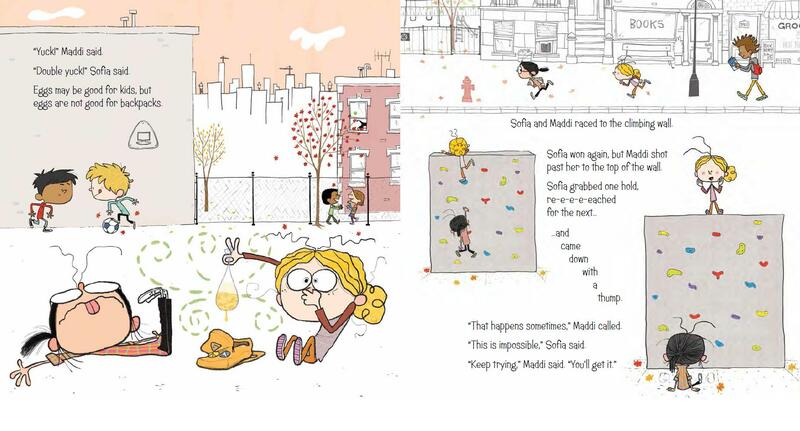 The illustrations add humor with the comic-like characters and a neighborhood setting that could be your neighborhood. Randomly open the book and odds are good you will see a positive spread and probably humor. Only three pages express Maddi’s situation and her embarrassment. The author kept Maddi’s Fridge a story kids will enjoy and understand. In the end, the two girls must work out what it means to break a promise. Will Maddi be upset with Sofia? What is more important: promises or people? (Or best-friend people?) Maddi’s Fridge could easily have been a message story or had the lack of food a constant talking point. 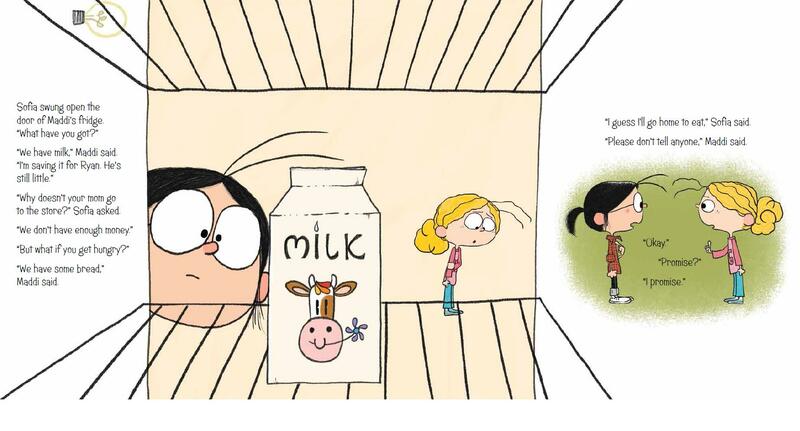 Instead, Maddi’s Fridge is a sweet story about two best friends taking care of each other. Oh, there is another side story where Maddi helps Sofia, but I can’t fit it all in. Sorry, you will need to read Maddi’s Fridge. The story is perfect for story time, teachers of grades K to 2, and homeschoolers. Maddi’s Fridge is a sweet story that remains positive, refusing to become sad or gloomy, though the subject of hunger can certainly be both. MADDI’S FRIDGE. Text copyright © 2014 by Lois Brandt. Illustrations copyright © 2014 by Vin Vogel. Reproduced by permission of the publisher, Flash Light Press, Brooklyn, NY. Buy Maddi’s Fridge at Amazon—B&N—Book Depository—Flash Light Press—your favorite bookstore. Learn more about Maddi’s Fridge HERE. Sounds like a great friendship story. I love the page spreads and the illustrations. Great review, Sue! Hey, Lobo. I bet you don’t have an empty fridge. Since you don’t like to hunt, you must have lots of fruits and veggies in your fridge. Good stuff! This book sounds awesome! I’ve never heard of a story like this. It sounds like it was well-done for a tough subject. Cool illustrations too! This is the first story on empty fridges I have ever heard of. It may be a one-of-a-kind. I love this book and the illustrations couldn’t be cuter. Great review, Sue! Thanks. I think you would like this one. Good for homeschoolers. This book sounds cute and fun. Pepito does look somewhat cat-like. Plus he’s really lucky to get some human foods in his bowl. Mom only shares a couple of crumbs with me. If I had a fridge, it would look like Maddi’s!! I think you should have a fridge like Sofia’s not Maddi’s. A nicely filled fridge of bones, turkey, hot dogs, and whatever you like to drink. My dogs liked lemon juice. A friend says all dogs like soda (just not Vernor’s).